Happy New Year! 2017 was a banner year for me. I was commissioned to write a book about bourbon called The Bourbon Bible which will be published in May 2018, and because of the book and my other spirit reviews, I tasted well over 120 whiskies in 2017. With all of these under my belt I felt like a top 10 list was in order. Now not all of these were newly released in 2017 but for many, it was my first time drinking them. J&B Rare Blended Scotch Whisky is a great value blend that is a little too sharp to drink neat but works great on the rocks, or in a highball. Check this out of you are looking for a good blended Scotch with a bit more smoke and malt character then Johnnie Walker Red Label. George Dickel Classic No.8 Sour Mash Tennessee Whiskey has nice notes of apple cider and pear with a light aroma of caramel and oak lingering in the background. The finish is soft sweet and lingers with long notes of caramel, cinnamon, oak and pear. This is a very nice light flavor Whiskey that is slightly sweet and fruity. Excellent neat and works great in a tall refreshing cocktails. Wyoming Whiskey Small Batch Bourbon Whiskey has rich notes of caramel, oak, and cinnamon followed by flavors of plums, and peaches. After swallowing, the whiskey is sightly warm in the mouth with a lingering note of stone fruit and vanilla. This is a very fine example of a craft bourbon that should be drunk neat or used in a cocktail. Nelson's First 108 Tennessee Whiskey is a special release from the first 108, 30-gallon barrels of their self-distilled and aged spirit. The whiskey is incredibly complex with notes of caramel, vanilla, raisin, prunes, nutmeg, cocoa, tobacco, and rich black earth. This is a complex and interesting Tennessee Whisky that shows incredibly promise for the whiskeys that are likely to come from Nelson's Green Brier. Waitsburg Cask Strength Bourbon Whiskey is an aromatic and flavorful bourbon with notes of cinnamon, nutmeg, creme brulee, and rum raisin followed by a touch of oak for balance. Overall this is a big sweet bourbon that is completely drinkable at 58% ABV and definitely a whiskey for those who like sweeter bourbons. Joseph Magnus Straight Bourbon Whiskey envelops you with deep and complex notes of fruit cake, dried fruit, baking spice, candied orange peel, dark cherries and raisin balanced by tobacco, leather and oak. This is a really fantastic and well balanced bourbon. Johnnie Walker Wine Cask is a really fruity and approachable expression of Johnnie Walker and is a really nice addition to the traditional lineup. This whisky also demonstrates how much character can come through the cask selection. For less than $30 this is a deal. Garrison Brothers Single Barrel Texas Straight Bourbon Whiskey has rich notes with dark aromas of vanilla, dried fruit, and tobacco, balanced with nice wood notes of cedar and oak accompanies by hints of smoke and dark chocolate. This is an excellent bourbon especially at only 3 years old. It is rich in flavor, incredibly smooth at 94 proof and well worth the investment if you are looking to splurge a little. Elijah Craig Single Barrel Kentucky Straight Bourbon Whiskey Aged 23 Years is incredibly rich and concentrated with notes of dried fruit, rum raisin, cherries, plum, baking spice, vanilla and caramel, followed by a light bright note of alcohol. This is a rich and decadent bourbon that is both very sweet and well balanced with dryness from the oak. Definitely drink this neat and savory the rich complexity that comes from 23 years of developing and concentrating flavor in a an oak barrel. 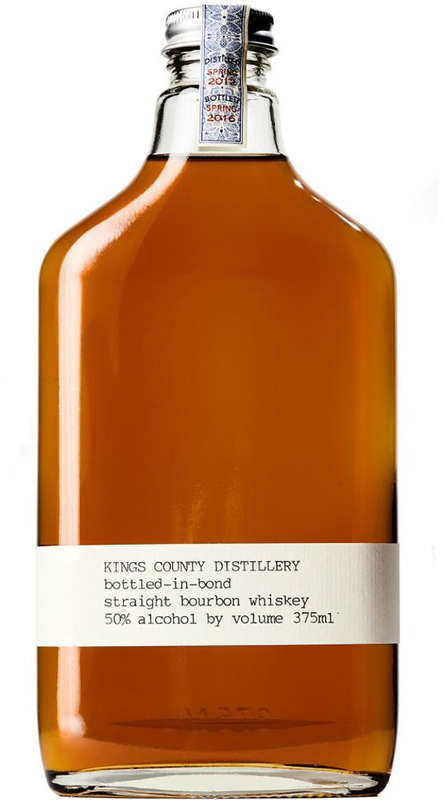 Kings County Bottled in Bond Straight Bourbon Whiskey is rich and decadent with notes of fig, dried fruit, caramel, vanilla and baking spice. the whiskey very smooth with a medium body and slightly sweet on the palate. The finish is long and dry though there is a sense of sweetness from the lingering flavor of vanilla that is intermixed with oak and tobacco. This is a very complex bourbon that is packed full of flavor. Kings County had come into their own and are no longer dominated by small barrel flavors. Drink neat to experience all it's flavor and intensity, or add a little water to soften the alcohol slightly. Owned by Diageo, Johnnie Walker Blender's Batch Wine Cask Blend Blended Scotch Whisky was distilled and matured in Scotland and bottled at 40% ABV. For over 100 years Johnnie Walker has been making renowned Blended Scotch Whisky. For much of that time Johnnie Walker was represented by its Red and Black label expressions and in more recent years Johnnie Walker expanded their color series to include Double Black, Green, Gold, Platinum, and Blue Labels. Most of these blends played with ratios of grain and malt, more peat or less peat, and the maturity of the whisky. While each color had a distinct flavor profile they are all basically in the same wheelhouse. However, around 2007, Johnnie Walker's Master Blender Jim Beveridge began an experiment, maturing some of their whisky in barrels that previously held other wines and spirits. Blender Aimée Gibson, came upon some of these barrels and created a unique blend of Scottish grain and malt whiskies, some of which included whiskies aged in wine barrels. The Blender's Batch Wine Cask Blend is the sixth experiment in this series, and it was first released in September 2017. Nose: The nose is very pleasant and inviting with notes of vanilla and marmalade with a touch of nectarines and sweet cherries. Palate: On the palate there is an explosion of fruit with notes of sweet orange, nectarines, plum, and a hint of vanilla balance out with oak tannins. Finish: The finish medium dry and while initially it is very warm, the warmth quickly fades and leaves the lasting notes of sweet white nectarines, with a touch of oak, vanilla, and a flavor reminiscent of a fruity Riesling. Conclusion: This is a really fruity and approachable Johnnie Walker that mellows out nicely with a little ice to cut the heat from the alcohol. Overall, it is a very nice addition to the traditional Johnnie Walker lineup and it demonstrates how much character can come through the cask selection. For less than $30 this is a deal and one of the best new, and affordable whiskies of 2017. That Boutique-y Whisky Company is an independent whisky bottler who selects unique whiskies from around the world. Nose: The nose is very complex and layered with notes of fresh summer berries, zinfandel, milk chocolate and a touch of nuttiness. Palate: The palate is viscus and round on the front with a well balanced sweetness. The flavor has notes of sherry, malt and roasted nuts. Finish: The finish is slightly hot and dry with a woody flavor and notes of cured tobacco. Lastly there is a subtle bitterness from the oak tannins. Conclusion: At 30 years old, this Macallan has taken on an incredibly dark color like stained mahogany that is almost completely opaque from the side. The finish is slightly bitter however, after spending 30 years in a barrel it is quite a feat that the whisky isn't completely dominated by oak. The fact that the whisky is still showing well is a testament to the quality of the barrels and the mild climate in which the spirit was aged. Thank you to Master of Malt and That Boutique-y Whisky Company for providing the free sample. That Boutique-y Whisky Company is an independent whisky bottler who selects unique whiskies from around the world. Their Carsebridge Batch 1 comes from the famed and long closed Carsebridge Distillery in Alloa, Scotland. Located in the Scottish Lowlands, Carsebridge was originally founded by John Bald as a malt distillery in 1799. Apparently Mr. Bald's sons who took over its management, switched the distillery over to making grain whisky in 1851 as the popularity of Blended Scotch began to rise. In 1877, Carsebridge and six other distillers joined together to from the Distillers Company Ltd. and about 90 years later became part of the Scottish Grain Distillers. Finally in 1983, amidst the world decline in whisky popularity, Carsebridge closed its doors and in 1992, the distillery was demolished. Thankfully, there are a few barrels of this amazing whisky still around. That Boutique-y Whiskey Company were able to find 52 year old barrels of their single grain whisky and bottle it at 40.5% ABV. Here single refers to the fact that the whisky in the bottle comes from one "single" distillery. In Scotland grain whisky is made from a mash malted barley, and any other malted or unmalted cereals, which often means corn, wheat, or rye. The regulations for grain whisky do not require the use of a pot still like with malt whisky, so as a result, grain whiskies are usually produced with column stills. Nose: The nose is vibrant a touch of alcohol intermingled with notes of maraschino cherry and a touch of vanilla. A light aroma of oak belies its age. Palate: Is incredibly smooth, initially the whisky shows notes of vanilla, rum cake and a touch of oak without any bitterness. However, as the whisky slides over the tongue the flavors transform into a cornucopia of tropical fruit. Notes of passion fruit and guava that is reminiscent of fine aged rum. Finish: The finish is dry and very long with subtle notes of passion fruit, guava and fresh green grapes reaching out to the horizon. Conclusion: This is an amazing whisky that is a delight to drink neat. I am awe struck that the oak flavors have not totally dominated the spirit but instead is acting as a support for the wonderful fruit flavors that have developed over the last half century. I am not usually one to think of spending hundreds of dollars on one bottle of whisky however, if I was in the market for a truly once in a lifetime bottle that has the quality to match the price this would be at the top of my list. That Boutique-y Whisky Company is an independent whisky bottler who selects unique whiskies from around the world. Their Blended Whisky #1 was designed to highlight older malt and grain whiskies from Scotland that when blended creates a smooth and well balanced drinking experience. Batch 3 was released in 2016 and the youngest whisky in the blend was 35 years old. Nose: Initially the nose has a strong alcohol bite but after it has a little time to breath, a very strong and fragrant aroma fills your nose. At first there are notes that remind me of Islay peat with its distinctive combination of smoke, iodine and sea air. And, underneath this first layer of aromas are notes of chocolate, fresh apple, and caramel. Palate: The palate is smooth with a light touch of heat from the alcohol and medium bodied. The whisky is pleasantly sweet on the tongue with a flavor that is not immediately obvious but reminds me of sweet corn bread. As the whisky warms in your mouth the flavor begins to reveal some of the smoke character followed by briny sea air. Finish: The finish is mostly dominated by smoke with underlying notes of malt and a slight nuttiness. Conclusion: This is a very complex and flavorful blended Scotch that is easy to drink neat and will likely to appeal to those who prefer a touch more smokiness and peat in their whisky.